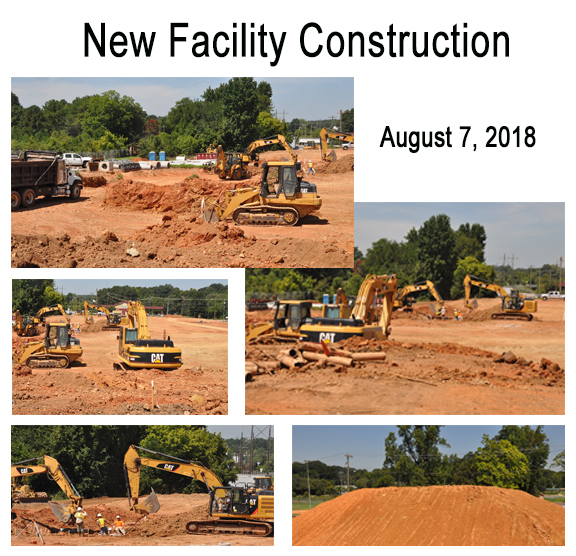 Construction is showing at the site of the new Community Shelter. Rain delayed work for a few days, but it’s great to see work continuing every day now. 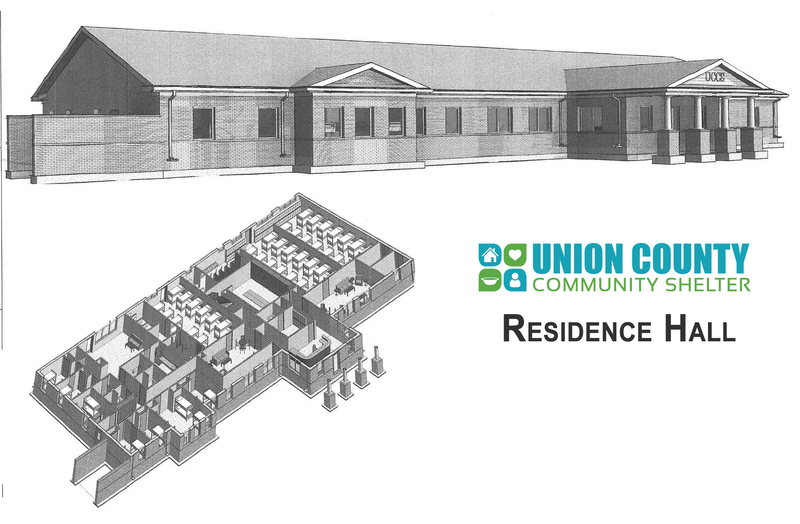 How does building a new Union County Community Shelter translate into building a better community? Our Shelter is not the film version shelter that provides beds and hot meals for homeless men seemingly without the motivation to improve their lives. We do provide temporary housing and meals ­– to men, women and children ­­– but our mission, programs and success stories tell a vastly broader story. Job loss, divorce, foreclosure, illness, family dispute ­– these can quickly move residents from independence to homelessness. Our goal is to promote a swift return to self-sufficiency for clients who often are shocked by their situation. By encouraging rapid rehousing, we are keeping temporar­y homelessness from becoming a chronic situation. 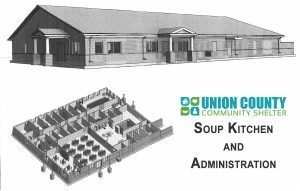 Our highly successful programs and services have grown significantly, but we need more space to better provide those services to all Union County residents who need them. We need your help. 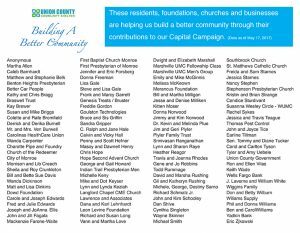 So proud to share a list of donors (through May 17) to our capital campaign. Thank you, thank you, thank you! 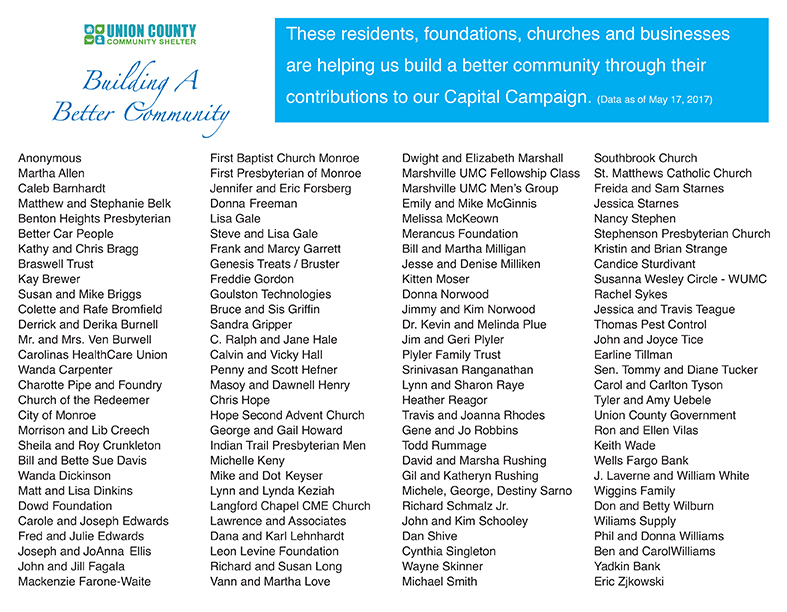 We appreciate your contribution to the community at large and to the hungry and homeless within that community.